In an ever changing world it is important to stay at the forefront of technology developments in the data and analytics space. To this end, Altis are introducing our Lunch and Learn Series of events, each quarter we will hold a lunch and learn event where we will present an innovative technology or solution to help keep you educated and informed of what’s happening in the market. 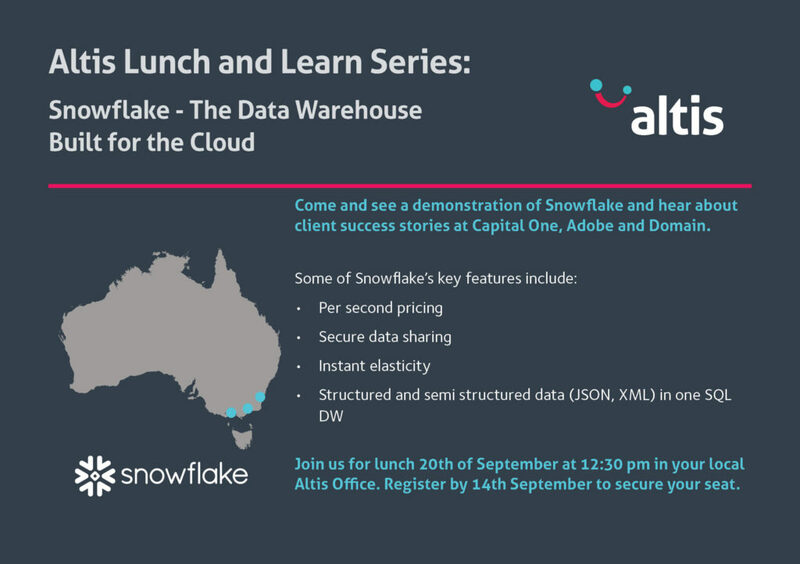 We will be kicking off our Lunch and Learn series with a session on Snowflake, the data warehouse built for the cloud, on the 20th of September in our Sydney, Canberra and Melbourne offices, where Snowflake will present and demonstrate their solution.